Scarabs help ward off the mummy and grant admission into the final chamber. The Pharaoh’s mummy is restless after years of grave robbers plundering his goods. It’s up to you and a band of fearless adventurers to bring the Pharaoh some peace. Which, obviously, involves making it past his boulder trap. Can you remove the boulders from the trap without causing an avalanche and save the mummy from his curse? 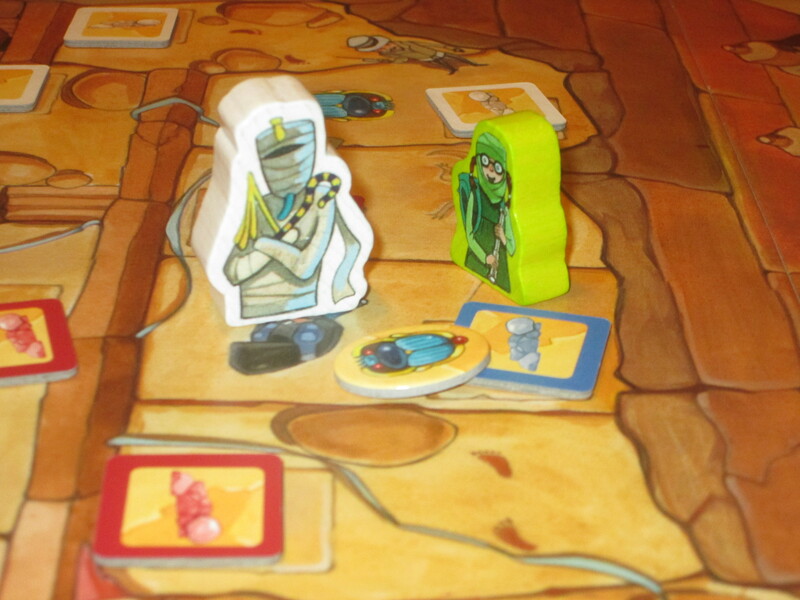 Pharaoh’s Gulo Gulo is a dexterity adventure game for two to six players. Players try to remove boulders from the boulder trap without knocking over the pharaoh’s staff or knocking other boulders out in order to move forward along the path. The first player to make it to the mummy’s chamber and defeat the final trap lifts the mummy’s curse and wins the game. 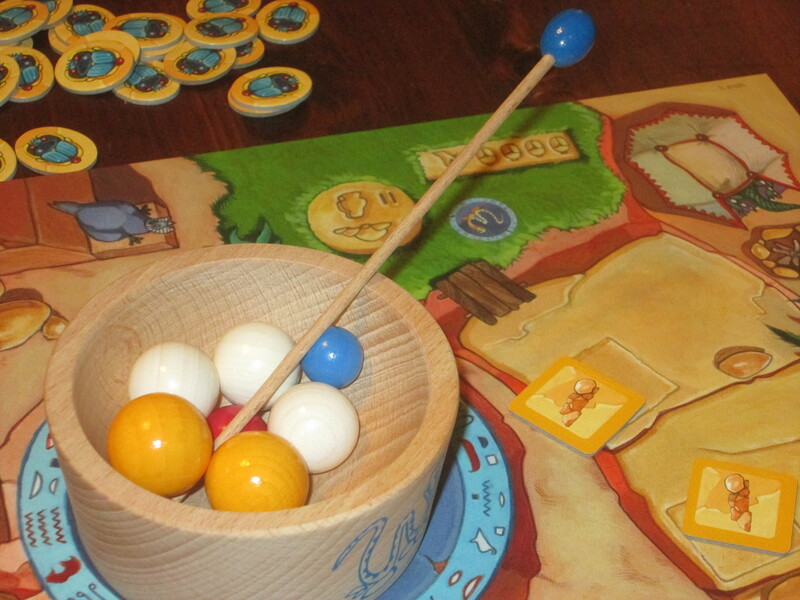 The game set up for four players. 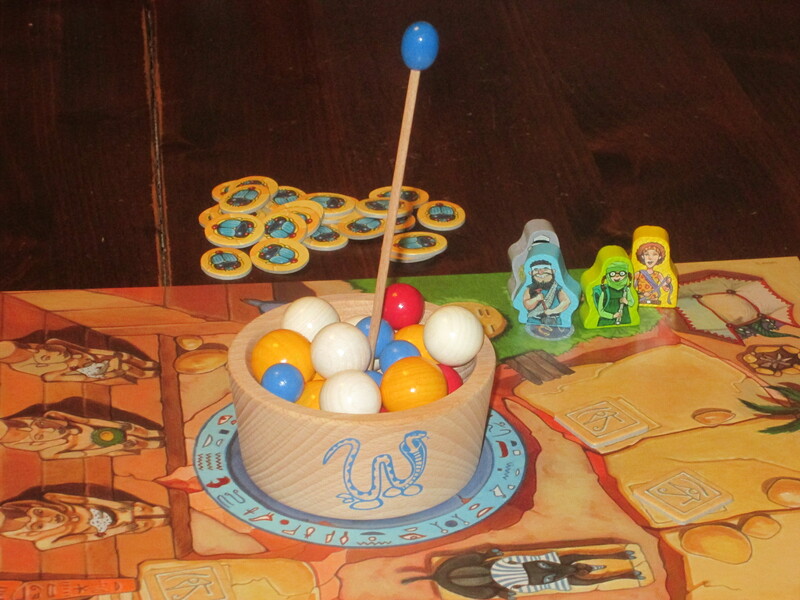 To setup, one player will mix the boulders in the bag, dump them into the wooden bowl, and set the pharaoh’s staff upright in the bowl. The tiles are sorted by back color and placed along the path to the mummy’s chamber. Finally, the pharaoh’s chamber trap tiles are shuffled and two are placed in the mummy’s tomb. 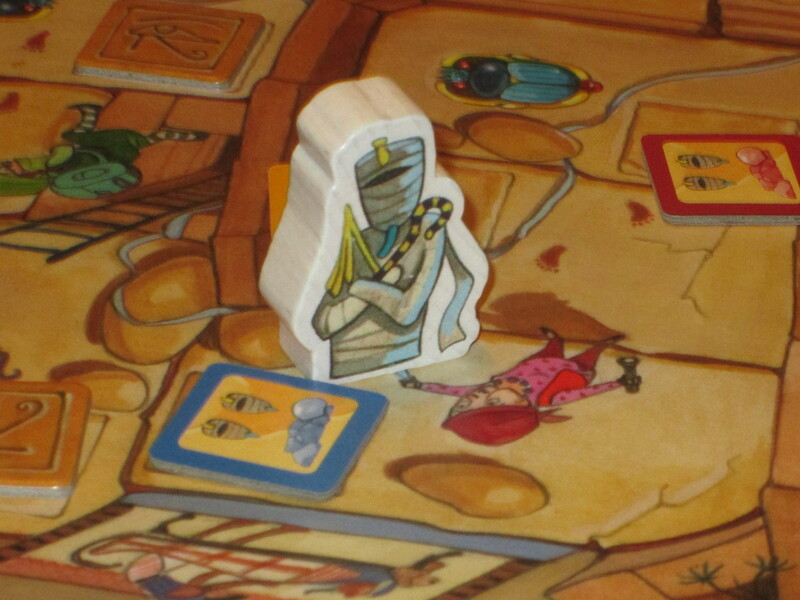 Each player chooses a pawn, the mummy starts at the tomb space, and the scarabs are placed in a supply. On a turn, players must either flip up the next tile along the path or choose a previously revealed tile. Each tile shows a boulder color. If the player can remove a boulder of that color from the trap without making the staff fall out or knocking other boulders out, he or she moves to the next tile of that color along the path (not necessarily the new flipped tile). If the trap is sprung, the player returns to the closest start space and the boulder trap is reset. The boulder trap is the centerpiece of the game. This is a tough dexterity challenge, especially when playing against kids. Along the path, players collect scarab tokens, which are used when the mummy touches you (to prevent you from going back to start) and to enter the mummy’s chamber. The first player to enter the mummy’s chamber and successfully remove the required boulders from the trap wins the game. Children’s games are often a double-edged sword. Yes, you want to spend time with kids, and yes, you want to introduce them to a hobby that interests you, but hoo boy, do you ever pay for those goals with luck fests, boredom, fights, and occasionally cheating. At our family gatherings, there is usually one brave soul who volunteers to play Sorry! with the kids, and when that person returns, it looks as if he or she has just been in battle. This is what makes Haba games such a huge hit among my family. They are games for children that are also interesting for adults. Animal upon Animal and Rhino Hero are among our adult favorites, even if the kids are doing something else. 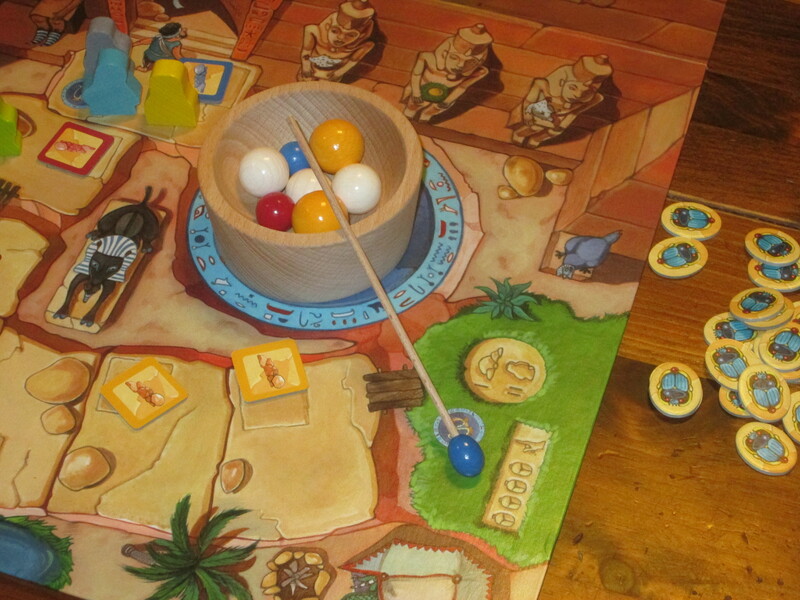 So I was quite excited to see that Haba was rereleasing the classic Gulo Gulo with an Egyptian theme. And after playing it, I don’t think my excitement was misplaced, although its applications are not as universal as the other games I mentioned. Players work to avoid the mummy. Also, the components are excellent. Look at that chunky pawn. The adventurers are ready for their expedition. 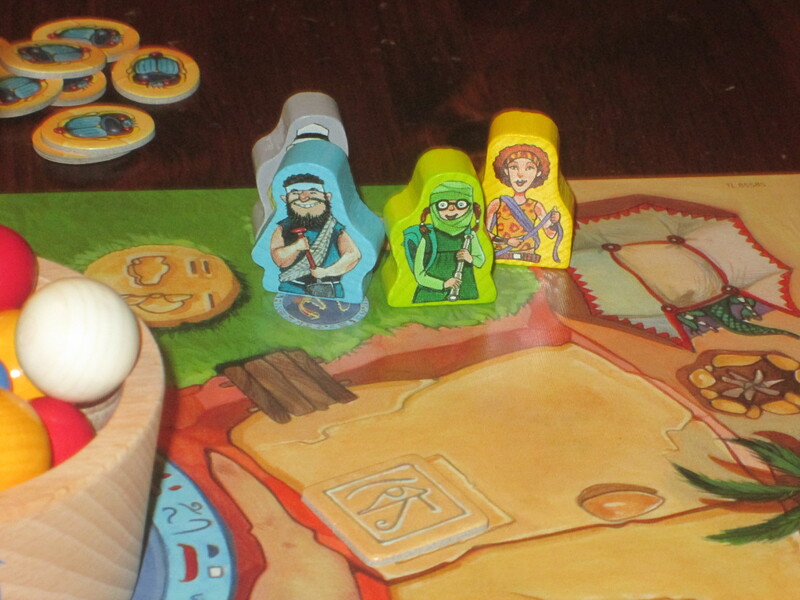 The gameplay in Pharaoh’s Gulo Gulo is a little simple for adults. Animal upon Animal is a big hit in my family, probably more among the adults even than among the kids. The challenge in Animal upon Animal is interesting enough that even after the kids are asleep, we still play it. 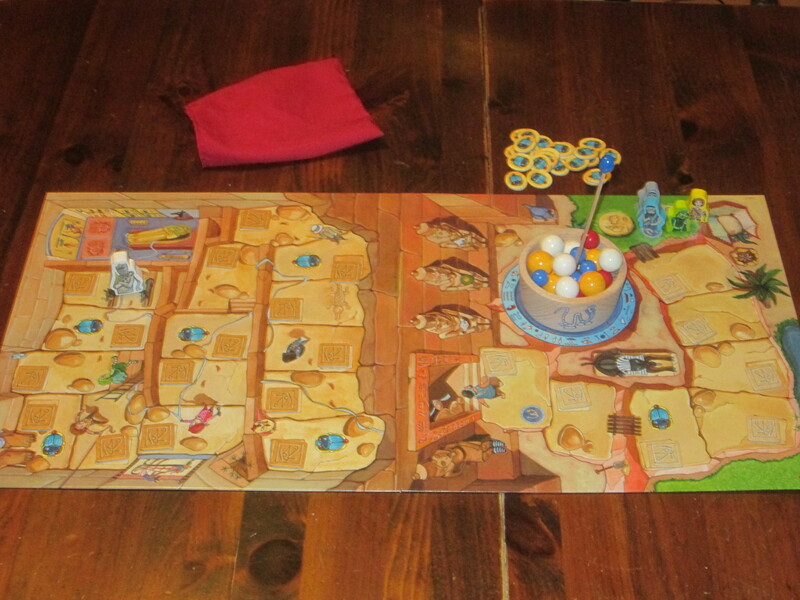 Pharaoh’s Gulo Gulo…remains on the shelf while the kids are in bed. My first exposure to the game was a game with all adults, and after we finished it, the prevailing opinion was, “Okay, so what’s next?” There just wasn’t enough going on in the game to keep us occupied. We thought the boulder trap was a neat novelty, but not interesting enough to make us want to play again. It’s very easy to set off the trap. The trap is considered sprung when either the staff hits the table/board or a player knocks a boulder out of the trap. But introduce one child into the mix, and Pharaoh’s Gulo Gulo is an instant hit. The reason is that the game is quite appealing to kids. I played this with my nieces–aged six and four. I was initially worried that the mummy might be scary for the kids (my nieces did not take kindly even to Paddington), but the game clearly presents the theme in a cartoonish way, so the mummy’s scariness was never mentioned. The six-year-old was excited because she had just studied Egypt in school, so she was rattling off pharaoh facts and asking awkward questions like “How can a mummy who is dead be alive?” And truth be told, she was much better at the dexterity portion of the game than the adults. It’s hard to convey just how difficult it is to reach into the bowl and take a boulder when you have large fingers. Each of us, when it was our turn, would roll up our sleeves, wince, and take it slow, trying our best not to disrupt the pharaoh’s staff. My six-year-old niece saw which color she needed, and in the blink of an eye she had the boulder like it was no big deal. We marveled at how well she did, and no matter how empty the trap seemed, I can’t remember her knocking the staff out. By the end of the game and in subsequent games, while the adults were performing our preparation rituals before grabbing a boulder, she would say things like “It’s so easy.” “Do you want me to just do it for you?” “Go for that one right there.” This was definitely a confidence booster for her. As boulders are removed from the trap, taking boulders gets a little…risky. The game’s basic mechanism is similar to Candy Land–flip up a tile/choose a color, move to the next space of that color. (It’s more interesting, though, because movement is contingent upon removing a boulder.) But the game also teaches some light strategy. You can choose the color that’s farthest out as a way to make progress, but you also have to weigh this against how difficult the boulder of that color will be to remove from the bowl or how much you need scarab tokens. You can also flip up a new token, trying to get a color that will let you move farther, but if that color appears along the path anywhere before the new token, you move there instead. So there’s some luck pushing in the game. My six-year-old niece understood this part of the game, although my four-year-old niece struggled here. 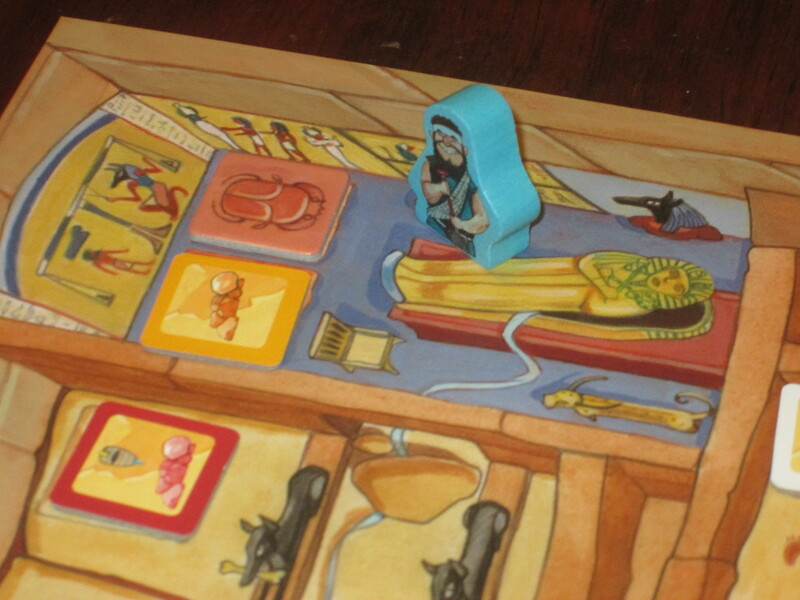 Pharaoh’s Gulo Gulo introduces some additional complexity over the original–namely, scarab tokens and the mummy. The mummy and scarab tokens make the game slightly more interesting for adults, but they made the game harder for my nieces to understand. The scarab tokens give players an additional consideration to weigh when choosing a color to move to because you need some scarab tokens to win the game. My nieces enjoyed trying to outrun the mummy, but they had a hard time understanding the strategy of getting scarab tokens. However, it’s easy to adjust the rules for different groups. With very young kids, you can eliminate the go-back-to-start rule and leave out the scarabs and mummy to keep the game moving. With slightly older kids you can just eliminate the scarabs and mummy, or just the mummy. The age range on the box–7+–is probably right for the full game, as even my older niece struggled with the mummy and scarab rules. Can blue get the boulders out and break the curse? Yet I’m okay with the game being a little beyond their (or other children’s) grasp. I think it’s good for them to be stretched (although there were points when my four-year-old niece checked out completely–she’s still gaining the attention span for games). The strategy in Pharaoh’s Gulo Gulo is simple enough that older players can coach younger players and hopefully teach them the logic involved in making one decision over another. Pharaoh’s Gulo Gulo does not involve grueling strategic choices–it’s more of a dexterity game than anything–but I think it offers the right mix of strategy and dexterity for younger players to teach them about evaluating options and making good choices. 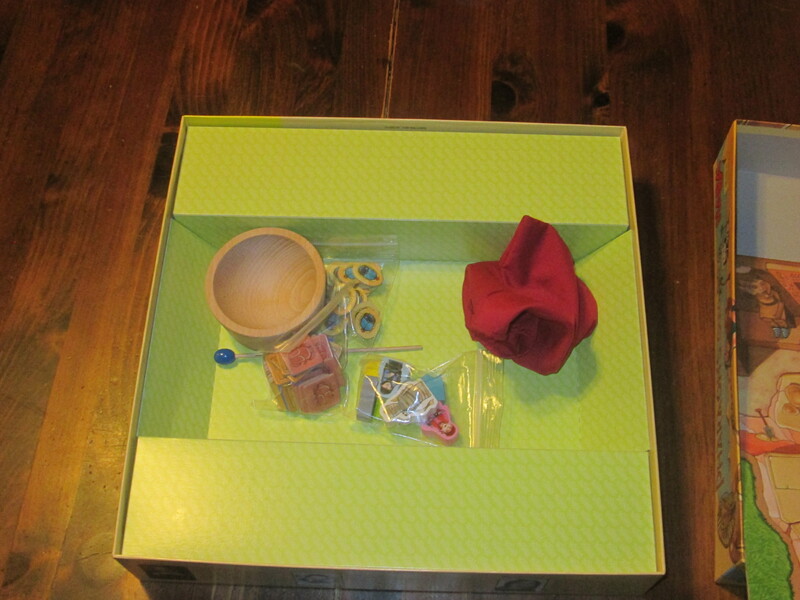 The box for Pharaoh’s Gulo Gulo is…enormous. I wish it were a little smaller, although the rest of the components are fantastic. Of course, that sounds like educator speak. What I’m missing in that is that Pharaoh’s Gulo Gulo is fun to play with kids. It’s fun to see their eyes light up just at seeing the components, it’s fun to see them succeed at something that is difficult for you, and it’s fun to sit at the table with a game for kids and not want to claw your eyes out (playing Sorry! with this same group produces that emotion). While I would never choose or recommend this game with a group of adults, it might be my first recommendation if kids want to play something, especially with how easy it is to adapt the rules to different audiences. After I taught the game to my six-year-old niece, she kept requesting to play it. And I didn’t mind that. I quite enjoyed having another way to connect with her–even though her tiny fingers gave her a huge advantage. 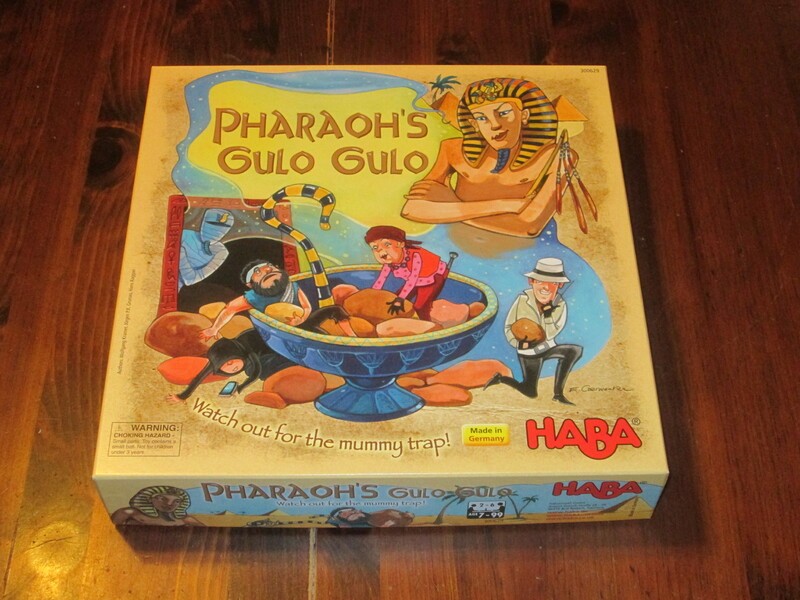 iSlaytheDragon would like to thank HABA USA for providing us with a review copy of Pharaoh’s Gulo Gulo.